Tenerife is definitely one of the best destinations in the world to visit and also an amazing place to live. It is such a diverse and unique island which will surprise and delight you with all the amazing things to see, do and experience. Here at Tenerife Magazine, we like to help you uncover the many incredible features of the island, rather than spending all your time at your hotel or resort. We know how tempting a week sunbathing by the pool can be, but to truly experience the real Tenerife and all it has to offer we suggest spending plenty of time exploring. If you’re looking for amazing places to visit or to stay in and aren’t feeling particularly adventurous though (although Tenerife is perfect for exciting adventures), then you won’t go wrong with the gorgeous seaside resort town of Los Gigantes. 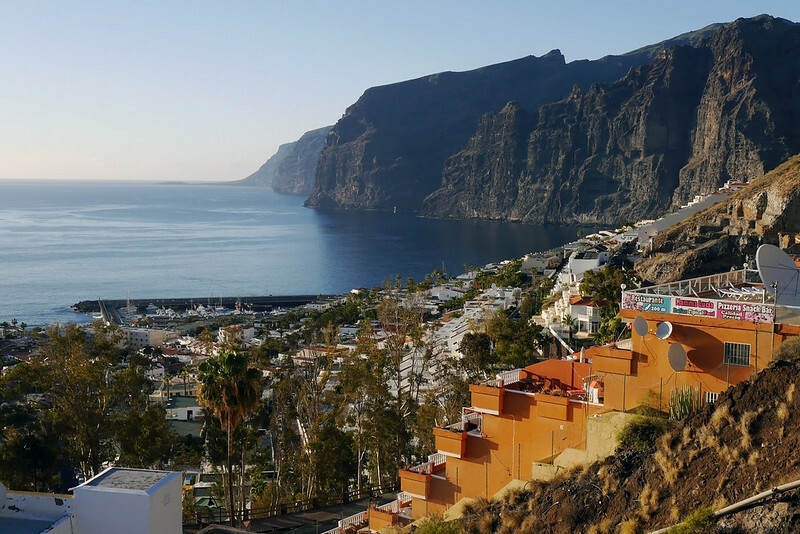 The town of Los Gigantes is located on the stunning south-west coast of the island which is bathed in beautiful sunshine almost all year round. Unlike other parts of the island where the weather can be a little less predictable, you will almost certainly find blue skies and the spring-like temperatures that Tenerife is world famous for. Even during winter months, you can still enjoy strolling around during the day in shorts and t-shirt and sunny days at the beach or by the pool. The town is in the municipality of Santiago del Teide and is just a short distance from Puerto de Santiago and Playa de la Arena, two other lovely holiday resorts. It is also only around 30 kilometers away from the livelier resorts of Playa de Las Americas and Los Cristianos which are easy to reach by car, or the convenient and frequent direct bus route. The town is named after the absolutely incredible Acantilados de Los Gigantes (“Cliffs of the Giants”) situated just north of the town. The first time you see these 500 meter high cliffs in real life you will see that they really do live up to their name. They completely show off the immense power of nature, and we can almost guarantee you will be awestruck at their size and beauty! The town is perfect for either a day trip to see these cliffs and the many other fantastic features, or for a longer stay of a week or more with many hotels and holiday apartments. There are also a variety of houses and apartments for rental or sale if you choose to make the town your home which we are sure you might be tempted to after a visit. 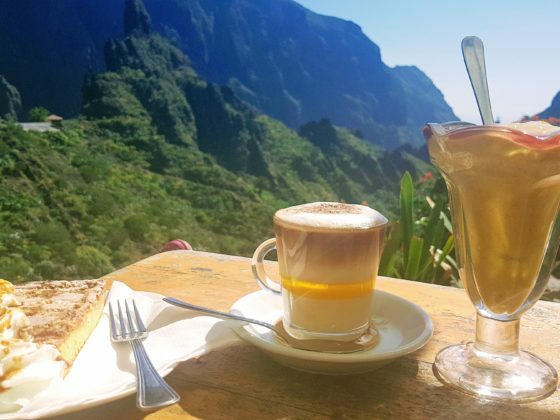 Los Gigantes offers the best of both worlds: being relatively quiet and perfect for a peaceful holiday or place to live, but also still with many places to enjoy with live music acts and plenty of things to do. Unlike other parts of the island such as Playa de Las Americas and Los Cristianos which have a whole host of bars and nightclubs and have a livelier, loud party atmosphere, Los Gigantes, and surrounding towns are brilliant for families or couples looking for a quieter, more relaxed stay. All of the resort’s central apartment complexes and residential area, with the exception of one multi-story hotel, are low-rise, thus blend in well with their surroundings. Because the town is naturally closed in on all sides, located within natural rocky boundaries and the Atlantic Ocean, there is little chance of it dramatically expanding in any direction and losing its peaceful atmosphere or air of exclusivity. The streets of Los Gigantes are quiet, safe and narrow, with a one-way system operating throughout most of the town. Most of the time you won’t be disturbed by the constant noise of traffic driving by or masses of crowds. Instead, you will find plenty of excellent restaurants, cafes, and shops that you can enjoy at a much more relaxed pace. The main features of the town are the Marina, The Plaza, and the Avenida Maritima main street. There is also the small, clean, black-sand Los Guios beach located next to the Marina. While the beach is perfect for families with kids due to its safety, luckily it is rarely crowded. At the Marina, you will be able to gaze out at a variety of different boats with an array of different sizes and styles, while enjoying a meal or drinks at the array of excellent bars and restaurants located there. The Marina definitely adds to the feeling of exclusivity and luxury, as you sit with friends and family gazing out the boats bobbing quietly up and down in the water. To the right, you will be treated to the incredible cliffs rising dramatically out of the water. There are certainly few other places with such an incredible combination of natural and man-made view while you enjoy your meal or drinks. It is easy to while away many hours here in this gorgeous setting and before you will be able to witness a beautiful sunset out on the ocean horizon. At the Marina, you can also book a variety of different excursions including jet-skiing, scuba diving, fishing trips, sea kayaking, a trip to see dolphins rent a boat and sailing trips. In addition, the taxi boat to and from Masca bay also depart from here, either to collect and bring back those who have hiked down the Barranco, or take out those who want to hike up to Masca village (both of which are amazing hiking excursions). This is a pretty, pedestrianized plaza based around the church. Surrounding the plaza are a variety of different bars and restaurants offering a wide variety of different types of meal to suit all tastes. Taking place at the plaza are the majority of town events including the carnival de Los Gigantes (the week after Ash Wednesday). A perfect place for a great day out in the town is at the stunning Oasis Los Gigantes leisure center. There are few places on the island that can compete with this center for its gorgeous setting and superb features. It has a beautiful infinity pool with views out to the deep blue Atlantic Ocean, surrounded by verdant green grass and tall palm trees which give that added tropical feel. If you are used to heading to your local swimming pool leisure center back home in the UK or other northern European countries, then this is a total world away. 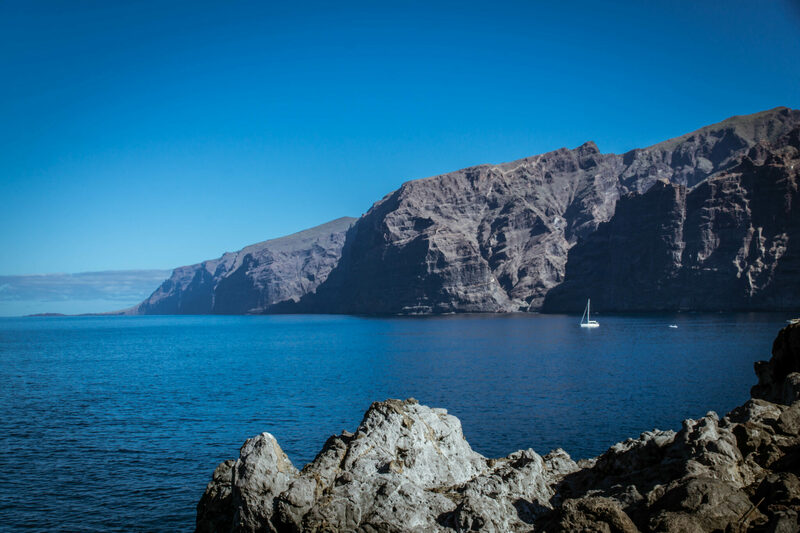 What’s more, while you relax in the pool with a huge horizon of the ocean in the distance, surrounded by an Oasis of green, there are also the stunning Los Gigantes cliffs in plain, breathtaking view. As well as the main infinity pool, there is also a huge new slide, a separate children’s pool, a large pool bar with plenty of seating and views out to the ocean, a restaurant with a wide selection of delicious meals, tennis and bowls, and private Bali beds which can be booked for that little bit of extra luxury. If you’re looking for an action-packed excursion taking in the incredible sights of the cliffs of Los Gigantes, then you should definitely book a trip with the excellent West Tenerife jet ski excursion company. Based out of the Los Gigantes Marina, the company takes you out on a boat and then you will transfer onto one of their amazing, modern jet-skis for some super fun. During the trip, you will literally be speeding along beside the giant Los Gigantes cliffs taking in their true splendor. From the town the cliffs are amazing but seen from a jet ski while you speed alongside them, it really is something else. It feels like some kind of fantastic dream, but the wind in your hair and the sound of the jet ski engine reminds you that it’s very real! 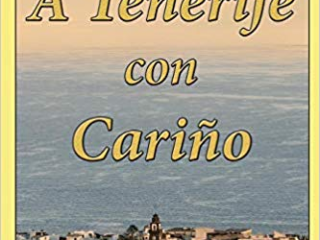 This isn’t only a jet ski adventure though, as later on you will meet with another boat and be taken to the Punta Tena to see the lighthouse of Teno. This is also a very interesting area and from here you will be able to snorkel in the clear water and try out the super fun underwater scooter. With this motorized scooter, you can power yourself deep under the water for a unique perspective beneath the waves. Later on, you will jet ski back to the Los Gigantes Marina and enjoy the incredible cliff views again. As you can tell, Los Gigantes is an amazing place to visit and stay in, with plenty to do, see and experience. 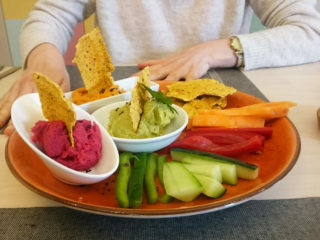 This is just a selection of some of the things you can enjoy in this beautiful seaside resort town and we certainly recommend checking it out yourself to experience all that the place has to offer! Make sure to follow us on social media to keep up to date with our recommendations about Los Gigantes and the island in general.